The ‘It’s a Bug’s Life’ education resource is on its way – but what has been the impact of this project so far? 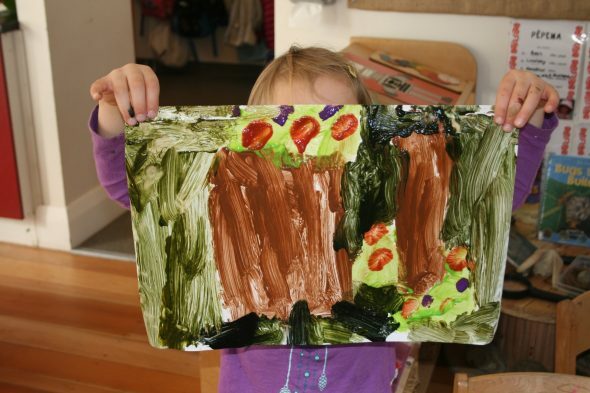 In this post, we hear from Imagine Childcare – one of our three ECE partnership groups. They are using the expertise they gained through our research to inform their Department of Conservation (DOC) ‘Habitat Heroes’ project one year on. Habitat Heroes at Imagine: How can we increase our native bird biodiversity? Since partnering with Te Papa in creating the resource, ‘It’s a Bug’s Life’, (see our other posts here and here) we have continued to strive to offer science based experiences for our tamariki, including planned and spontaneous experiences. So naturally, when we were given with the opportunity to be a part of a Department of Conservation (DOC) project called ‘Habitat Heroes’, presenting the ability to work with the five science capabilities again, there was no hesitation in agreeing to participate. ‘Habitat Heroes’ is an annual nationwide competition that DOC runs to encourage education sectors to get out and to explore their local environments, in search of an environmental issue. The next step is to then plan a suggested change improvement. One of the key focuses is around how to ensure biodiversity in our environments. Our first port of call was to do some exploratory research – a skill that the ‘Bug’s Life’ project taught us well (Gather and interpret data). What did our children already know? What is the definition of a habitat or a hero? Most children were knowledgeable about heroes from their prior knowledge of superheroes including Batman and Superman, but were less familiar with habitats. This knowledge resulted in setup experiences to extend their learning. 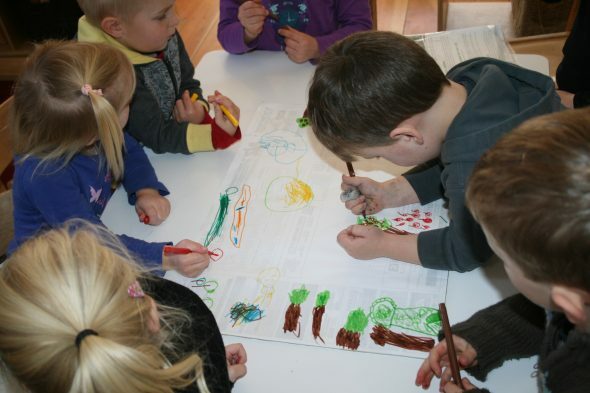 Visual resources were available and used as discussion tools while land, sea and sky habitats were made by the children and displayed along with their drawings of the types of creatures that call these particular habitats their home (Interpret representations). We then looked into which specific environment issues can affect each habitat. We came together to talk about land, water and air pollution and the causes of them (Engage with science). Jack recognised that “pollution is smoke” – referring to his prior knowledge of steam engines. Charlotte suggested that if there is pollution in the sea that the animals who live there would “move to another ocean” as “they wouldn’t like it”. Alma thought that “they would die”. Our tamariki also had the opportunity to watch Dr. Seuss’s The Lorax on YouTube to reinforce the detrimental effects that people (who aren’t careful) can have on a habitat. We also emailed whānau and had a hui (meeting) with our tamariki to talk about our local habitats/green spaces and how we could look after them. Many children were aware of local businesses and facilities (Rory- “Petone train station, fish and chip shop”, Augustine- “cafe, Pak N Save, Sacred Heart”, Thomas- “Korokoro School”) but weren’t so familiar about the natural habitats that are in our local community. Meanwhile, through some awesome resources, our budding scientists were becoming interested in the study of birds. The presence of a bird’s nest on the science table, containing a couple of empty egg shells sparked some wondering about what used to be in there and how the nest was made. This prompted us to get books from the library to search for answers, followed by birdwatching activities (Gather and interpret data). 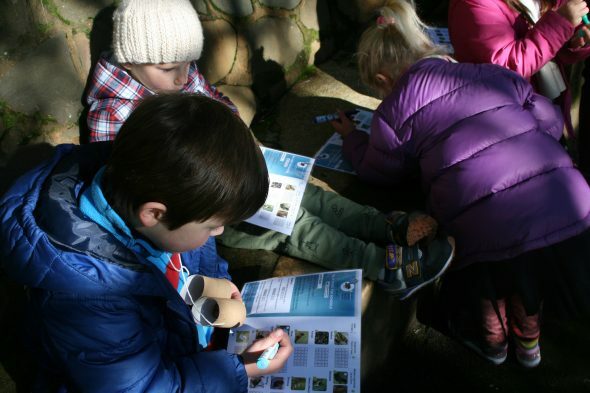 A couple of children had some prior knowledge of a few of New Zealand’s native bird species; Thomas– “Tuis” (are “green” with “white under its neck”, “kiwis can’t fly, they can eat worms”, Augustine– “Fantails”, Beau -”pigeons”(wood pigeons- Kereru). Birdwatching charts were printed out and laminated to be used by our enthusiastic ornithologists (a type of scientist that studies birds) during their birdwatching sessions. From the charts, pictographs were drawn up to record the findings (Intepret respresentations). It appears that sparrows are the most frequent visitors to our garden, with seagulls flying overhead in stormy weather along with a couple of blackbirds and fantails. We have even had the privilege of listening to and spotting a couple grey warblers (I’m sure a benefit thanks to the presence of the nearby Percy’s Reserve). 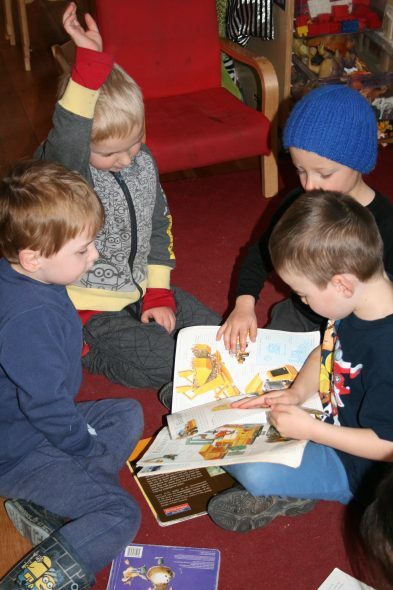 On a daily basis the ‘New Zealand Bird’ book from the library was read at wa whariki (mat times). Feedback from a parent confirmed that some of our tamariki were referring to their Imagine learning experiences at home too. Apparently Nixon has been pointing out the different types of birds that he sees at home to his family, exclaiming that this bird is a ‘so and so bird’, readily able to recall their names based on the things he notices about them (Use evidence). We had discussions about what may attract native birds to Imagine’s garden: Beau- “food”, Ruby- “sleep in the trees”, Max- “tui trees” (kowhai trees). Max was aware of these as he had some kowhai trees at home that Tui frequently visited. 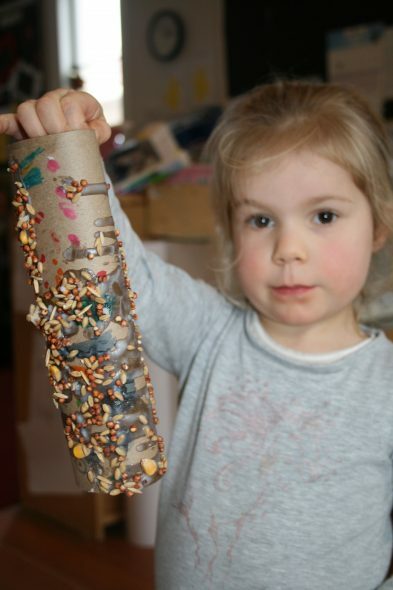 These conversations evolved into attracting more manu (birds) by producing bird feeders using rolled up paper, lard and bird seed (Use evidence). Again the introduced sparrow was the most abundant visitor. They are typically found in areas of human habitation (i.e. cities and towns) and are classified as a pest due to their nationwide abundance. Cecilia thought that the sparrows were visiting in our gardens in search of “worms and grass”, Renee thought “leaves”, Rory was convinced it was the “bird feeders”. I wonder if their large numbers are affecting the presence of our native bird populations? It would be interesting to find out (Gather and interpret data). 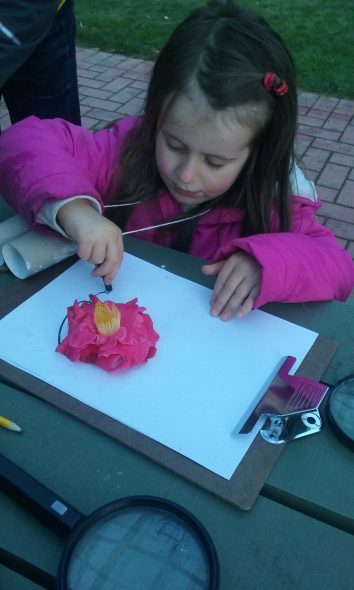 Paper plate bird feeders were made to be taken home so that bird populations could be observed in our children’s gardens as well. 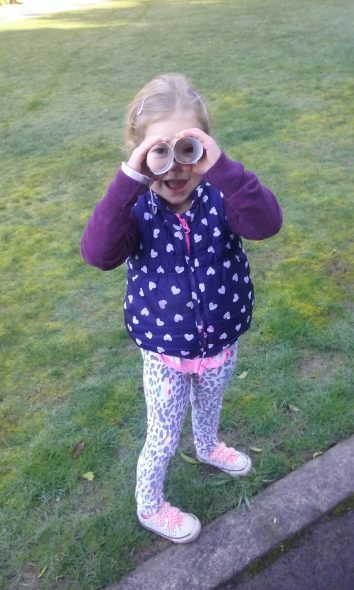 An email was sent out to whānau containing the bird watching chart to be used as another resource for observations and recording. We thought that by doing this we would get a good comparison of the differences between the different habitats and the birds present within and out of Imagine. However, an even larger comparison may be had using our nearby resource, Percy’s Reserve (Critique evidence). The trip was planned and along with our parent helpers we were off. On arrival we began our investigations into the habitat’s diversity by splitting up into two groups; one went with Nichola (kaiako) to do some flora and fauna specimen drawings with charcoal, while Adela (kaiako) ran a bird watching session with the other group. Initially, each child was asked “What can you see?”; Max- “trees”, Alma- “trees and flowers”, Thomas- “Birds”, Lila- “flower”, Eli- “sparrows”, Baylee- “waterfall”, Nixon- “spider web “and Beau- “birds flying”. This habitat did have a few more natural aspects to offer compared to Imagine’s garden. 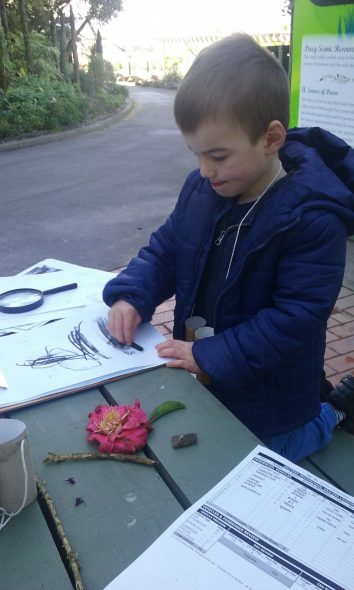 Our tamariki were excited to find lots of natural objects to study and draw with the charcoal, even experimenting with using rubbing patterns of the leaves by using the charcoal on its side (Interpret representations). Nichola (kaiako) talked about the importance of not picking leaves or flowers off the plants but rather using the ones off of the ground, to take care of precious living things. During the bird watching session binoculars (that were previously made at Imagine, from paper rolls) proved to be handy focusing tool. Adela (kaiako) questioned why there may be some variations in the birds’ presences, and the tamariki came up with hypotheses. Why do birds live in Percy’s Reserve? Why do you think we haven’t seen many birds today? “(The) goose scared some away”- Eli (in response to a loud sounding bird call). “They don’t want to come to Imagine. They are scared”- Thomas. How could we get them to visit us? Once the groups had undertaken each activity we gathered together to partake in an Invertebrate Hunt!! A bird’s presence wouldn’t be the same without such an important food source. The children’s eagerness to participate was evident and soon after a short talk about what to do and what insects may be found, children and adults set off with their tally charts in hand in search of the reserves mini beasts. Spiders were found on the rock wall, along with flies bathing themselves in the warmth of the sun. Orb web spider webs could be viewed stretching between the tree trunks, beautifully shining in the sunlight (Gather and interpret data). Of course the trip wouldn’t be complete without a search through the weta cave. With torches for visual aid the caves walls were illuminated. A number of Cave weta were spotted clustered together in large numbers moving their large antennae in response to the presence of the light. Their massive hind legs enable them to jump up to two metres, a long distance for such a small creature. Lunch was then had at the picnic area and then we set off back to Imagine for a well-deserved rest. Many of the science capabilities were intertwined into the methods of our research, including gathering and interpreting data, using and critiquing evidence as well as interpreting representations through the presence of numerous bird observations and discussions, reference books, the internet (used to educate about pollution and NZ bird species), visual representations and pictographs. Through our work we have learnt that the biodiversity of the New Zealand bird species present within our Imagine garden is lacking, therefore our next step is to engage with science and find ways of increasing this. Thanks to our trip to Percy’s reserve we were able to give our tamariki the opportunity to transfer what they learnt at Imagine and translate that into a different habitat. Knowledge of the natural and physical worlds are said to support children in enabling them to participate more within their local communities (Mana Whenua – Belonging). 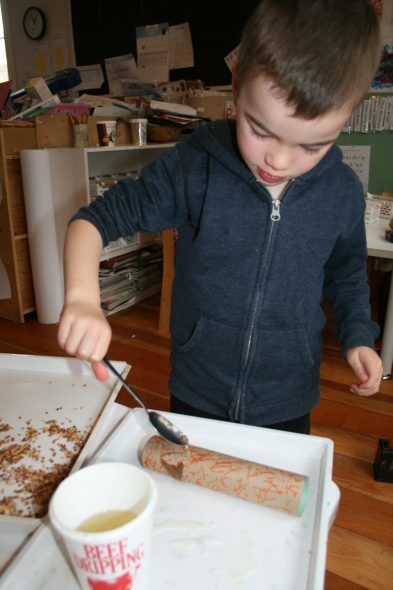 Through engaging in scientific activities and discussions our tamariki were able to develop the vocabulary and techniques learnt to investigate and communicate their ideas about the world around them (Mana reo – Communication). 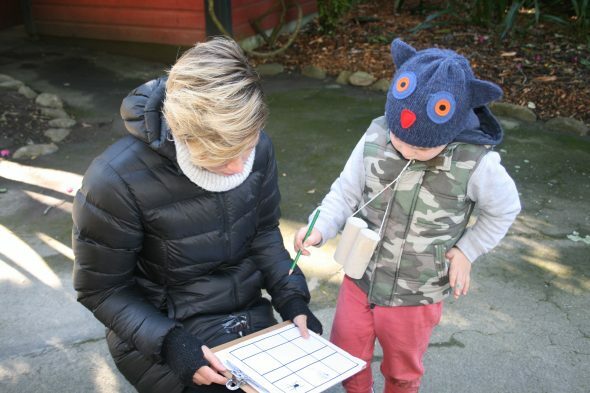 In response to our excursion, invertebrate hunts were performed in Imagine’s garden using the same tally chart used in Percy’s Reserve. We found out through our ‘It’s a Bug’s Life’ work that consistency is very important in science. These sheets have been laminated and placed in the science table resource box to be used as an independent resource. These events have indicated to us just how connected the natural world is – what our current invertebrate populations are like can affect bird populations. 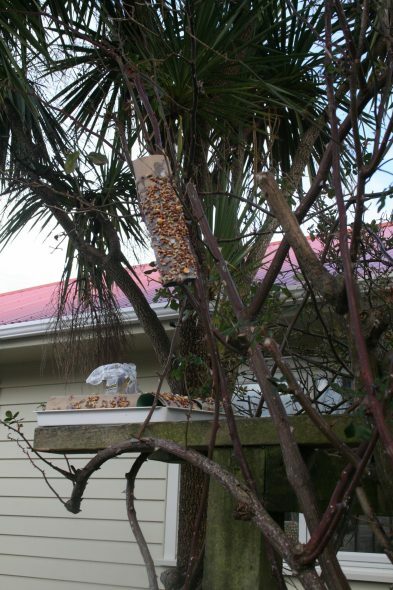 Through discussions with our tamariki they concluded that to increase native bird biodiversity we need to “look after” them, “to give them food” (Renee); provide feeding stations and plant more native trees. Perhaps even an upgraded insect hotel (which we created during the It’s a Bug’s Life project) would be sure to have some effect! Emails have been sent out to Forest and Bird, the local council, and Te Papa’s scientists in an attempt to initiate discussions with them about our project and their take on the best way to proceed. By researching action plans and forming networks with field experts we are fulfilling the final science capability of engaging in science too, as we are participating in scientific issues and discussions. Our final write up will be a PowerPoint demonstration of our findings and if we are successful within the competition we will be granted the resources to create a habitat that supports a greater level of native bird biodiversity. We know that making conclusions and sharing our findings is a big part of science! We hope that by upgrading our garden there will be a rippling effect on the number of native birds present within our local region. It would also be very interesting to look into which bird species are prevalent in our local area prior to the development. We may have to go out door knocking to survey and find out. Thank you Imagine Childcare for sharing this wonderful story with us! It is great to see the applicability of our research to work happening through other national institutions, like DOC. Keep up the fantastic work! We look forward to sharing the ‘It’s a Bug’s Life’ resource with you all ASAP.